Hey, George Noory, I think aliens came in the middle of the night and messed up our calendars. Or maybe Johnny Depp made this poster. He was dumb enough to star in a 4th Pirates movie. Who knows? BTW, "This Year's Best Family Film" is taken from a website called artistdirect.com. You decide whether that's a credible source or not. I think not, as more respected critics bashed the film for being marketed to kids, but containing an abundance of obscenities, primarily H-words, not to mention that the humor of the film mostly comes from Western insider jokes. However, Rango doubtless will be the year's best ANIMATED film, seeing how all we've gotten so far is Rio and Cars 2, with Puss in Boots (The 5th in the Shrek saga) and Happy Feet 2 (The 1st was an epic failure of a movie on every single level). Kung Fu Panda 2 doesn't look awful, but it is an unnecessary sequel, and Rango is an original idea. Gee, what is it with sequels now in Hollywood? I guess people don't want to use their heads and brainstorm new concepts for films. That's difficult. 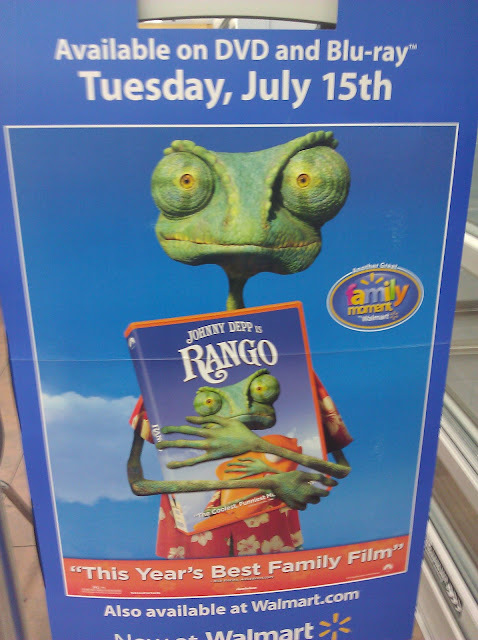 If you're just reading this post, it turns out my assumption that Rango would be the best animated film of 2011 was not ill made. I'll explain why in exhaustive detail the very next opportunity I get: next Monday perhaps? (Dang), I can't stand the wait.